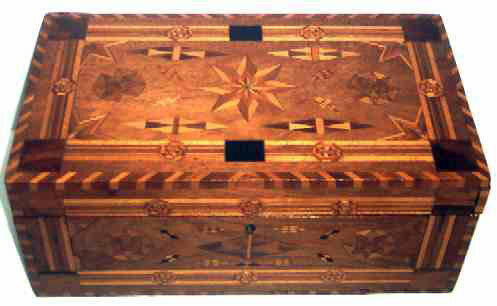 Presented here, an exceptional sailor-made Box inlaid with multiple woods. The box itself is walnut and the bottom is oak. Dating to the second half of the 19th century this box is a fabulous example of Folk Art. Compass Rose, Pinwheels and Diamonds abound . . . just about every surface on the box is inlaid. It is truly incredible! It appears that there may have been a mirror on the inside of the lid as evidenced by some residual bits of glue. Hinges are original and fastened with hand-cut screws which would indicate a 19th century piece. We believe this to be sailor made because of the abundant use of the Compass Rose motif and the incredible amount of time it would have taken to accomplish such a feat as this. This was an amazing undertaking even for someone with a lot of time on his hands, waiting for a whale sighting. It is truly a work of art and readily fits in with the Scrimshaw boxes shown in Flayderman's Scrimwhaw and Scrimshanders in design and motif. Size is 11" long x 6-1/4" wide x 4-1/2" high.